Academic units of the university may employ graduate students in four types of graduate assistantships: teaching assistantship, lab assistantship, research assistantship, and general graduate assistantship. The type of assistantship offered a student depends on the needs of the academic or administrative unit and the qualifications of the individual student. Whenever possible, the duties assigned to a graduate assistant should be relevant to the graduate program and the professional goals of the student. Graduate students may hold multiple types of assistantship positions. The combination of the graduate assistantship(s) and departmental supplement cannot exceed 20 hours of work per week. Students must continue to be full-time taking at least twelve hours of graduate credit in both fall and spring semesters and nine hours of graduate credit in summer semester. A salary guide for graduate assistants is distributed annually by the Graduate School. Descriptions and responsibilities of each type of graduate assistantship are provided below. Graduate teaching assistants (GTAs) are students enrolled in the Graduate School who are assigned instructional duties in a course regardless of the student’s specific instructional responsibilities in an academic course. All GTAs are required to fulfill the requirements set forth in the TA/LA Policy, including attendance at the TA/LA Orientation, completion of GRSC 7770 or equivalent course, and demonstration of language requirement (international students). GTAs should work under the supervision of experienced faculty members as a means of developing teaching skills in the academic discipline. GTAs may be assigned as an Instructor of Record for a course or a section that is part of a regularly scheduled course. As an Instructor of Record, the graduate student may have autonomy for teaching and assigning grades as per UGA Policy 4.07-13 Instructor of Record, BOR policy, and SACS standards for teaching faculty. Departments are responsible for verification of academic credentials and language requirements for GTAs assigned as Instructors of Record. Contact the Office of Faculty Affairs at 706-542-0547 if questions about Instructor of Record requirements for GTAs. Graduate laboratory assistants (GLAs) are students enrolled in the Graduate School who are assigned instructional duties in a laboratory section regardless of the student’s specific instructional responsibilities in an academic course. All GLAs are required to fulfill the requirements set forth in the TA/LA Policy, including attendance at the TA Orientation, completion of GRSC 7770 or equivalent course, and demonstration of language requirement (international students). GLAs should work under the supervision of experienced faculty members as a means of developing teaching skills in the academic discipline. GLAs may be assigned as an Instructor of Record for a lab course or a section (L-suffix) that is part of a regularly scheduled course. As an Instructor of Record, the graduate student may have autonomy for teaching and assigning grades as per UGA Policy 4.07-13 Instructor of Record, BOR policy, and SACS standards for teaching faculty. Departments are responsible for verification of academic credentials and language requirements for GLAs assigned as Instructors of Record. Contact the Office of Faculty Affairs at 706-542-0547 if questions about Instructor of Record requirements for GLAs. 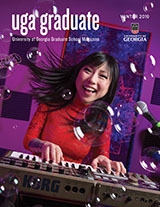 Graduate research assistants (GRAs) are students enrolled in the Graduate School who are assigned to assist one or more faculty members in the conduct of research. In most instances, research assistants are assigned duties such as library searches and laboratory experiments under the close supervision of faculty mentors. Per UGA Policy 4.07-13 Instructor of Record, GRAs cannot be assigned as an Instructor of Record and cannot have instructional duties. Presidential Graduate Fellowships (first two years) and Graduate School Assistantships are classified as research assistantships. Graduate research fellow assistants (GRFAs) are typically students who are recipients of external fellowships that do not provide tuition benefits. Students are eligible for GRFA support if their external support is equivalent to a 40% assistantship at the minimum rate set for students at the doctoral or masters level in their program (as appropriate). Like GRAs, GRFA students are enrolled in the Graduate School and assigned to assist one or more faculty members in the conduct of research. In most instances, research assistants are assigned duties such as literature searches and laboratory experiments under the close supervision of faculty mentors. Students must provide documentation that their sponsoring agency allows them to accept paid work at UGA while on the fellowship and are subject to the same conditions of employment as other UGA Graduate Assistants. Per UGA Policy 4.07-13 Instructor of Record, GRAs cannot be assigned as an Instructor of Record and cannot have instructional duties. Graduate assistants (GAs) are all other students enrolled in the Graduate School who receive assistantships that are not specifically designated for teaching or research. Duties assigned to this category of graduate assistants may include assisting faculty with a variety of academic tasks, including but not limited to: providing technical support for courses taught by faculty; working on grant funded projects related to program development, evaluations, outreach, among others; gathering, organizing, and analyzing data for faculty; or working in a non-academic unit of the university, such as Student Affairs. Per UGA Policy 4.07-13 Instructor of Record, GAs can assist faculty with instructional duties but an approved and valid faculty member must be listed as the Instructor of Record in the Course Offerings Data Base and must be responsible for all aspects of the course.